Objective In primary care, assessing which patients with bowel symptoms harbour significant disease (cancer, higher-risk adenoma or IBD) is difficult. We studied the diagnostic accuracies of faecal haemoglobin (FHb) and faecal calprotectin (FC) in a cohort of symptomatic patients. Design From October 2013 to March 2014, general practitioners were prompted to request FHb and FC when referring patients with bowel symptoms to secondary care. Faecal samples were analysed for haemoglobin (EIKEN OC-Sensor io) and calprotectin (BÜHLMANN Calprotectin ELISA). Patients triaged to endoscopy were investigated within 6 weeks. All clinicians and endoscopists were blind to the faecal test results. The diagnostic accuracies of FHb and FC for identification of significant bowel disease were assessed. Results 1043 patients returned samples. FHb was detectable in 57.6% (median 0.4 µg/g, 95% CI 0.4 to 0.8; range 0–200). FC at 50 µg/g or above was present in 60.0%. 755 patients (54.6% women, median age 64 years (range 16–90, IQR 52–73)) returned samples and completed colonic investigations. 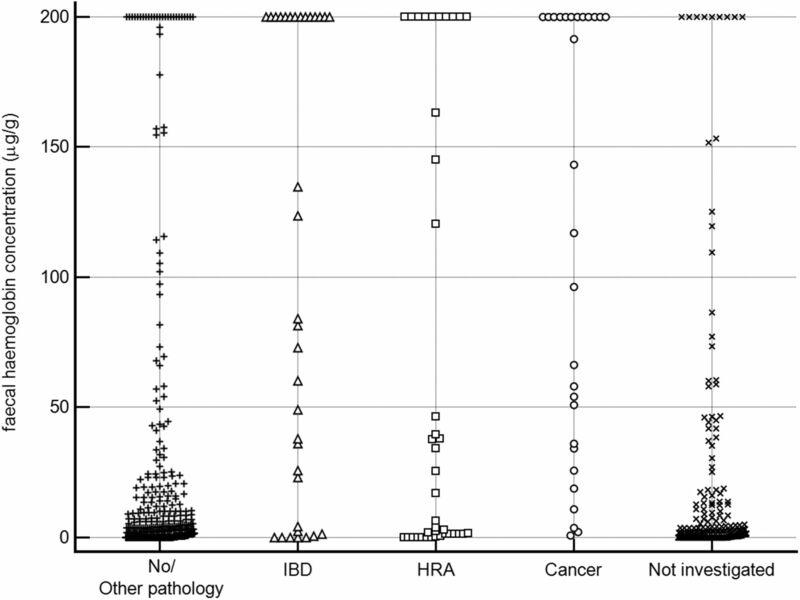 103 patients had significant bowel disease; the negative predictive values of FHb for colorectal cancer, higher-risk adenoma and IBD were 100%, 97.8% and 98.4%, respectively. Using cut-offs of detectable FHb and/or 200 µg/g FC detected two further cases of IBD, one higher-risk adenoma and no additional cancers. Conclusions In primary care, undetectable FHb is a good ‘rule-out’ test for significant bowel disease and could guide who requires investigation. Faecal haemoglobin (FHb) concentrations rise as the severity of underlying neoplasia increases. Faecal immunochemical tests (FIT) for haemoglobin have superseded guaiac faecal occult blood tests (gFOBT) as the recommended initial test in bowel cancer screening programmes. Faecal calprotectin (FC) concentrations rise with inflammation and are useful for monitoring IBD in secondary care. To date, no studies have examined the utility of simultaneous quantitative estimates of FHb and FC exclusively in primary care at the point of referral. FHb and FC can be measured from a single sample of faeces collected at home. Undetectable FHb measured in samples collected in primary care proved a good ‘rule-out test’ for significant bowel disease; cancer was excluded, and higher-risk adenomas and IBD were rare. FC at <50 µg/g ruled out IBD but missed cancer and adenomas. We have shown that FHb, measured with quantitative FIT, can be used in primary care at the point of referral as a reliable and objective predictor of underlying pathology. General practitioners have an objective tool to guide who requires further investigation in secondary care. Our health care system serves a population of around 400 000. Each year approximately 4000 patients are referred from primary care for assessment of bowel symptoms via a dedicated referral portal, ensuring equity of access and a streamlined booking process. Referrals are triaged by consultant gastroenterologists; 75% are brought straight to investigation and the remainder seen in outpatient clinics. The percentage of referrals from GPs marked as ‘urgent’ or ‘urgent suspected cancer’ consistently runs at 35–40%. However, when patients undergo colonoscopy, the yield of significant bowel disease is low, with local audit revealing CRC in only 2% and IBD in 5%. New means of assessing patients in primary care are urgently needed to help GPs determine which patients need rapid investigation and, in turn, ease pressure on secondary care services. Non-invasive faecal tests for blood and inflammation, already established in CRC screening programmes and IBD clinics respectively, may be helpful in this context. In this study, our aim was to study the diagnostic accuracies of quantitative FHb and FC tests in patients presenting to primary care with bowel symptoms. This prospective study gained the full support of GPs and was conducted following the STAndards for the Reporting of Diagnostic accuracy studies guidelines.19 All adult patients referred for investigation of bowel symptoms over a 6-month period from October 2013 to March 2014 were eligible. At the point of referring patients to the colorectal pathway, GPs were prompted to request FHb and FC tests alongside full blood count, urea and electrolytes and C reactive protein and record the presenting symptoms via the NHS Tayside electronic test requesting software. If patients had more than one presenting symptom, for the purposes of the present analysis they were attributed only one, in order of decreasing clinical importance as follows: rectal bleeding, anaemia, diarrhoea, altered bowel habit, abdominal pain and weight loss. The total number of referrals and the urgency of the referral were recorded on the referral management software. Practice nurses distributed an EIKEN specimen collection device (for the FHb sample), a plain blue-capped faecal container (for the FC sample) and a patient instruction sheet to each participant. Patients were instructed to collect samples from a single faeces for both tests and to return the samples immediately to the GP surgery. The samples were returned at room temperature via the GP surgery routine sample collection service (a daily van courier service) to Blood Sciences, Ninewells Hospital and Medical School, and stored at 4°C (FHb) or −20°C (FC) prior to analysis to ensure stability. FHb measurement was performed using a single OC-Sensor io analyser (Eiken Chemical Co., Tokyo, Japan). Inter-run imprecision was assessed with quality control materials (Eiken) in each run: Co-efficients of Variation (CVs) were 4.6% at 25 µg/g and 3.9% at 93 µg/g. Any FHb sample that was reported by the analytical system as a positive numerical result greater than zero µg/g was considered as a ‘detectable FHb’. FC was analysed after sample extraction using the Roche device (Roche Diagnostics, Burgess Hill, UK) using a quantitative ELISA Calprotectin EK-CAL (BÜHLMANN Laboratories, Switzerland) on a Dynex DS2 (Alpha Labs, Eastleigh, UK). Inter-run CVs were 5.3% at 37 µg/g and 4.7% at 152 µg/g. Samples with results above the upper analytical limits were not diluted and re-assayed but reported as greater than that upper concentration limit. FHb results were converted from the instrument generated ng/mL to the internationally recommended unit of µg/g by multiplying by 0.2.20 The laboratory has a total quality management system in place and is accredited to ISO 15189 based standards. Patients referred to endoscopy were investigated within 6 weeks of referral. The endoscopy units participate in the accreditation scheme of the Joint Accreditation Group on GI Endoscopy. Participating clinicians and endoscopists were blind to the faecal test results. All findings were recorded on the endoscopy reporting system by the endoscopist. The diagnoses of CRC, HRA and IBD were confirmed following assessment by a gastrointestinal pathologist. Clinical outcomes were collected for all patients who completed the tests, and the diagnostic accuracies of FHb and FC for identification of significant bowel disease were examined. MedCalc statistical software (MedCalc Software, Mariakerke, Belgium) was used for all calculations and to produce distribution plots for both faecal test results. In total, 2189 patients were referred for investigation. Also, 1032 (47.1%) referrals were either ‘urgent’ or ‘urgent suspected cancer’. Of those referred, 1043 patients returned faecal samples; 12 patients were excluded (seven in whom neither faecal sample was suitable for analysis, four who returned samples outside the study period and one patient with known IBD) leaving 1031 patients (47.1%) who formed the study cohort (figure 1). The prevalence of referred symptoms within this cohort was altered bowel habit (42.7%), rectal bleeding (33.9%), diarrhoea (16.8%), abdominal pain (11.0%), anaemia (8.7%), weight loss (0.9%) and a palpable mass (0.3%). Eight patients submitted FHb samples that were spoiled or unsuitable for analysis. Thirty-nine patients returned FC samples that were classed as insufficient or unsuitable for analysis. FHb was detectable in 57.6% of all samples submitted (median 0.4 µg/g, 95% CI 0.4 to 0.8; range 0 to >200 µg/g). Using a FHb cut-off of 10 µg/g, the test was positive in 25.2% of samples. FC >50 µg/g was present in 60.0% of all faecal samples (median 69 µg/g; range 10 to >600 µg/g). Study flow diagram. CRC, colorectal cancer; GP, general practitioner; HRA, higher-risk adenoma. A total of 755 patients (54.7% women, median age 64 years (range 16–90, IQR 52–73)) returned faecal samples and completed bowel investigations and were included in the analysis of faecal test performance. 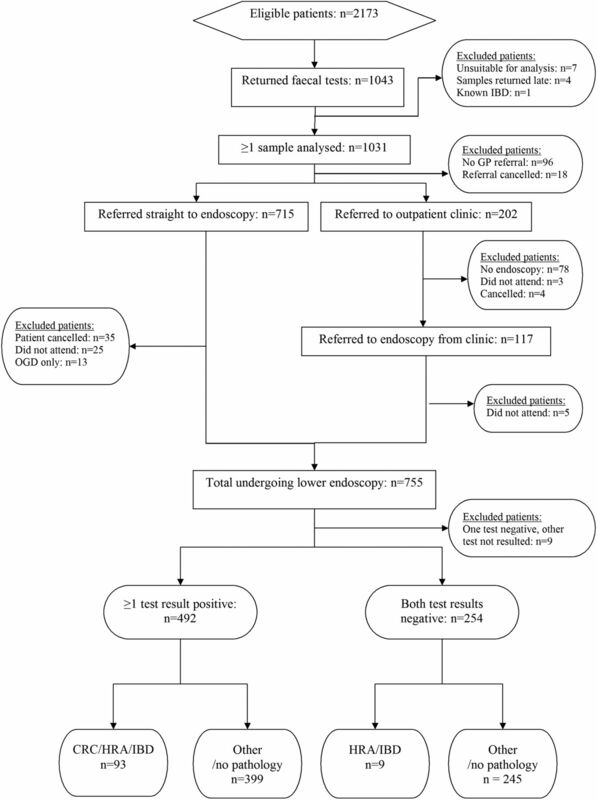 The most common findings at colonoscopy were normal in 241 (33.2%), diverticular disease in 190 (25.2%), haemorrhoids in 98 (13.0%), low-risk adenoma in 65 (8.6%), HRA in 41 (5.4%), IBD in 34 (4.5%) and CRC in 28 patients (3.7%). The PPV of referral symptoms for a diagnosis of CRC were palpable mass 50.0%, weight loss 14.3%, anaemia 9.0%, rectal bleeding 4.3%, abdominal pain 3.6%, diarrhoea 2.4% and altered bowel habit 2.2%. Rectal bleeding had a PPV of 21.0% for any significant bowel disease (table 1). Figures 2 and 3 display the distribution of FHb and FC from the 1023 and 993 samples, respectively, which were suitable for analysis. Results are displayed according to the findings of bowel investigations. In those patients with CRC, the median FHb was 130 µg/g (95% CI 52 to 200, range 0.8 to >200 µg/g). Three patients with CRC had FHb below 10 µg/g. The prediction of significant bowel disease was therefore based on the finding of any detectable FHb. Distribution of faecal calprotectin concentrations in patient samples collected in primary care according to the results of bowel investigations (n=993). HRA, higher-risk adenoma. The advantage of using quantitative assays is that cut-off concentrations that trigger a positive test result can be altered to regulate positivity rates and diagnostic accuracy (table 2). Selecting a cut-off of detectable FHb, the positivity rate in those completing investigations was 58.3%. The PPV for any significant bowel disease was 20.6%. 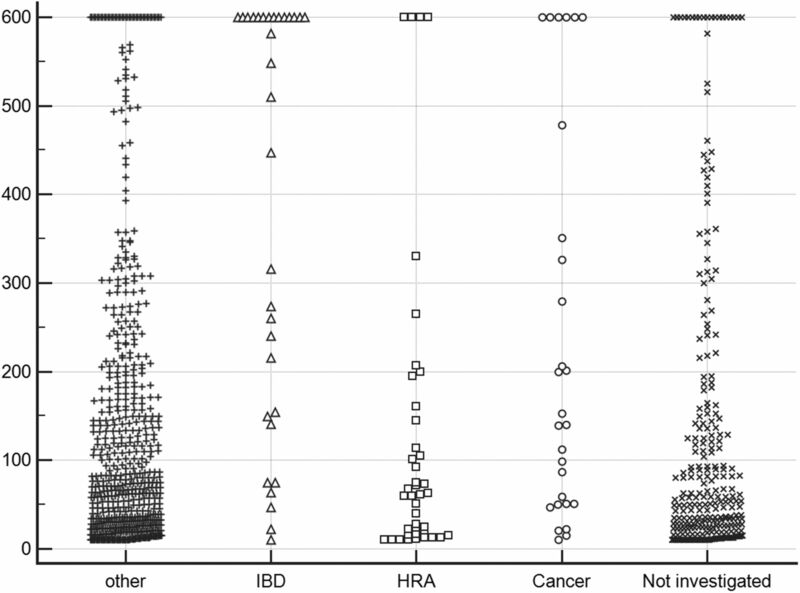 However, the NPV for CRC, HRA and IBD were 100%, 97.8% and 98.4%, respectively: 12 of 102 (11.8%) cases of significant bowel disease had undetectable FHb (seven HRA, five IBD). Interestingly, 256 of the 755 patients described rectal bleeding, but 87 (34.0%) of these had undetectable FHb. In this subgroup, only 3.4% had significant bowel disease (two with HRA, one with IBD), and the most common finding was haemorrhoids (38.0%). Selecting a FC cut-off of 50 µg/g (often used in differentiating possible IBD from irritable bowel syndrome), the positivity rate was 62.0%. The PPV for any significant bowel disease was 16.9% and the PPV for IBD was 6.4%. On the other hand, the NPV for IBD was 98.9%. However, 25 cases of significant bowel disease had FC below this cut-off (5 CRC, 17 HRA, 3 IBD). Selecting a combined cut-off of detectable FHb and/or FC at 50 µg/g generated a high positivity rate of 80.5%. The PPV for any significant bowel disease was 16.5%. However, only four cases of significant bowel disease were undetected using this strategy (three HRA, one IBD). Raising the FC cut-off to an arbitrary 200 µg/g, the positivity rate fell to 25.9%, the PPV for IBD increased to 12.2%, yet the NPV for IBD remained at 98.3%. However, more than half of the cases of CRC remained undetected. Selecting a combined cut-off of detectable FHb and/or FC 200 µg/g generated a positivity rate of 66.0%. The PPV for any significant bowel disease was 18.9%. At this combined cut-off, the NPV for CRC, HRA, IBD were 100%, 97.6% and 98.8%, respectively. Nine cases of significant bowel disease were undetected (six HRA, three IBD). This study demonstrates that patients presenting to primary care with bowel symptoms can be assessed with faecal tests and the results can help determine whether further investigation is required. Using detectable FHb as the criterion identified 58.3% as having a positive test result and gave a PPV of 20.6% for significant bowel disease. More importantly, undetectable FHb effectively ruled out the possibility of underlying CRC and the possibility of either HRA or IBD was rare. FHb was superior to FC in this setting; adding in FC at a cut-off of 200 µg/g identified a further 7.7% with positive tests, but investigation of these additional patients identified only two further cases of IBD, one HRA and no additional CRC. It is becoming clear from recent studies in CRC screening programmes that there are marked gender differences; it is well established that men have a greater prevalence of colorectal neoplasia, but it is now also clear that men harbour higher concentrations of FHb than women.29 We did not design our study to examine gender differences; however, we did note a trend for more significant bowel disease in men (15.5%) versus women (11.9%). Furthermore, with a cut-off of any detectable FHb, the PPVs for CRC, HRA plus IBD were higher in men than women (22.6% vs 18.3%), but there was no difference in NPVs. While there is a cogent argument to consider gender-specific FHb cut-offs in asymptomatic population bowel screening programmes, gender differences in PPV become irrelevant in a symptomatic patient with detectable FHb because invasive investigations would be required in all. The strength of our study is that it was conducted in a single health care organisation in which all referrals from primary care enter through a common referral pathway, removing selection bias. Faecal tests were requested at the point of referral and samples reached the laboratory via a daily delivery van service. The mean ambient temperature in this region of Scotland was never >16°C during the study: therefore, FHb degradation during transport would be minimal.9 ,30 The study cohort appeared to be typical of primary care referrals with 3.7% having underlying CRC, and rectal bleeding having a PPV of 4.3% for CRC. In population screening and in IBD clinics, FHb and FC cut-offs have been proposed. With symptomatic patients in primary care for whom the underlying diagnosis remains to be determined, we could not anticipate what the appropriate cut-off concentrations might be. We noted three cases of CRC in this cohort in whom FHb fell below the 10 µg/g cut-off concentration commonly used in CRC screening programmes and qualitative FIT. In consequence, we chose a cut-off of any detectable FHb for test performance analysis since no cases of CRC would be missed. When faced with a symptomatic patient, an undetectable FHb would reassure a GP that significant bowel disease would be rare. With FC at the widely used cut-off of 50 µg/g, this proved to be an effective ‘rule-out’ test for IBD, but would miss almost a fifth of CRC cases. This would not reassure GPs or patients. If FC is combined with FHb, only one case of IBD was missed, but the vast majority of patients would have a positive test (80.5%) and require further investigation. Raising the FC cut-off to 200 µg/g, combined with detectable FHb, dropped the combined positivity rate to a manageable 66.0%. However, only three more cases of significant but non-malignant bowel disease were detected at the expense of investigating 7.7% more referrals than using FHb alone. At present, in the absence of any reliable predictor of pathology, the vast majority of referrals from primary care for assessment of colorectal symptoms undergo invasive investigations but the yield of pathology is low. This study demonstrates that FHb and FC can provide objective information on the likelihood of significant underlying pathology but cannot replace common sense. Patients with anaemia or a mass require investigation irrespective of faecal test results. However, 34.0% with rectal bleeding had undetectable FHb; upon investigation haemorrhoids were the most common finding and the incidence of significant bowel disease was only 3.4%. Based on our findings, patients presenting to primary care with bowel symptoms could be tested with FHb and FC in the knowledge that approximately one-third of patients who would normally be referred for investigation will have negative test results and do not require immediate invasive investigations. In our health care organisation, this translates into almost 1200 patients per year who are highly likely to have no significant bowel disease and do not require immediate investigation. If FHb was the sole faecal test, that figure would rise to almost 1400. Moreover, using one only test has advantages since FIT specimen collection devices are more user-friendly, FHb is cheaper to analyse and has a more rapid turnaround time. In summary, this study demonstrates that non-invasive faecal tests requested in primary care provide a reliable prediction of the absence of significant bowel disease. FHb is superior to FC and enables, with a single faecal test, an objective assessment of the need and urgency of further investigation. Iain McElarney of MAST Group (http://www.mastgrp.com) helped in the design and production of the patient information sheets. Lynne Taylor, NHS Tayside Blood Sciences, distributed faecal test packs to GP practices and logged specimens on return. Paula McDonald, Laboratory Team Leader, Scottish Bowel Screening Centre, provided technical assistance with the EIKEN io analyser. NICE clinical guideline 27; Referral guidelines for suspected cancer. http://www.nice.org.uk/guidance/cg27/resources/guidance-referral-guidelines-for-suspected-cancer-pdf (accessed May 2015). NICE guideline; Suspected cancer: recognition and management of suspected cancer in children, young people and adults. http://www.nice.org.uk/guidance/indevelopment/gid-cgwave0618 (accessed May 2015). NICE Diagnostics guidance (DG11). Faecal calprotectin diagnostic tests for inflammatory diseases of the bowel. https://www.nice.org.uk/guidance/dg11 (accessed Dec 2014). WeatherSpark Beautiful weather graphs and maps. https://weatherspark.com/#!dashboard;ws=28758 (accessed Mar 2015). Contributors CM, JAS and RJCS designed, planned and conducted the study. RW analysed the faecal samples. JD performed the statistical analysis and produced the figures and tables. All authors contributed to data interpretation and writing of the paper. CM wrote the final draft, which was approved by all authors. Funding The study was funded by the Detect Cancer Early initiative of the Scottish Government. JD was supported by a grant from Tenovus. Competing interests CGF has undertaken consultancy with Immunostics, Ocean, New Jersey, USA; Mode Diagnostics, Glasgow, Scotland; and Kyowa-Medex Co., Tokyo, Japan: and has received travel support from Alpha Labs, Eastleigh, UK. Ethics approval East of Scotland REC.